The milk collected is subject to bacterial controls as soon as it arrives. We only retain the good milk for the production of our cheese. The E. Graindorge cheese dairy is the only one of its kind to carry out DNA bacteria tests before having the milk mature. The delightful taste is safely intact. The milk is naturally rich in fat and partly skimmed. Part of the raw milk is pasteurized or heat-treated in order to meet customer demands. These three types of milk are used to produce PDO-certified cheese for the French and export markets. The E. Graindorge cheese dairy recipes are passed down from father to son. Each stage of production uses a recipe carefully created by three generations of cheese makers. Yeasts (or rennet), help in the process of turning the milk into cheese. They are grown in the cheese dairy from natural ingredients coming from the surrounding terroir. It is then all the work of our cheese makers and our refiners to unveil all of the flavours of the cheese. They provide daily care and constant attention to respect the character and taste of PDO-certified cheese from Normandy. Normandy Camembert is moulded with a ladle and by hand. Just like in the past the moulders gently leave five layers of curd in each mould with a one hour interval in-between. It is this ancestral gesture that will give them their unique smoothness. Normandy Camembert therefore needs 5 hours to make. It is the time that is required to allow for the curd to slowly drain and therefore bring all its texture in Normandy Camembert. Livarot cheese is hand wrapped in their five towers sedges in natural reed. This is without doubt the most symbolic gesture of production at E. Graindorge cheese dairy. This step allows the cheese to keep its cylindrical shape during refining. The reeds in the olden days once grew at the edges of ponds on farms. Today the cheese dairy carefully cultivates them. Some Livarot cheese is wrapped in sedge paper. This feature has long been associated with the nickname “Colonel”, relating to the five stripes of ranking. Once the cheese is removed from their moulds, they are wiped again before going back to the drying room. 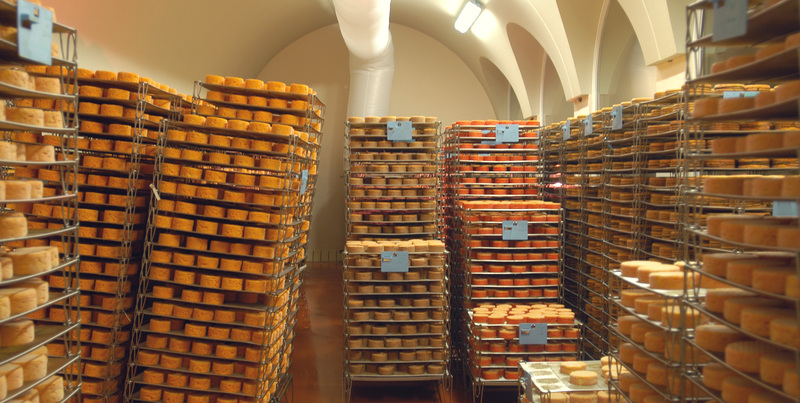 In the drying or ripening room, where the ventilation and temperatures are perfectly monitored, the master-refiner checks and ensures that the necessary care is given to the cheeses before they reach maturation. AOP Camembert de Normandie and AOP Neufchâtel are turned over twice while in the cheese cellar. AOP Pont Evêque is washed once at the start of refining, AOP Livarot is washed three times during refining. Once the time outlined in the specification sheet of each AOP has elapsed, the cheeses can be then packed and returned to the cellars for optimal refining.